Voyager is soon to be the first man-made object to leave the solar system. Data from NASA’s Voyager 1 spacecraft indicate that this deep space explorer has entered a region in space where the number of charged particles from beyond our solar system has significantly increased. This could mean that Voyager 1 may be at the edge of our solar system and about to leave it. The spacecraft Voyagers 1 and 2 were launched in 1977, originally designated to study Jupiter and Saturn, but have since continued their journey on to study the outer solar system. The image above depicts where the Voyager spacecraft are in relation to our solar system and the surrounding area. 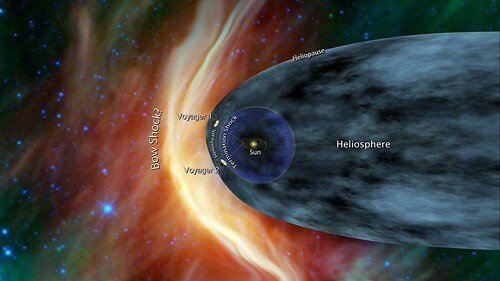 The Voyager team is looking at a few specific things that they expect will tell them when the spacecraft has punched through the ‘heliosheath’ – a kind of bubble around our solar system where stellar winds slow down dramatically. First, a great increase in the number of galactic cosmic rays (energetic charged particles from outside our solar system). The numbers appear to be on the rise, which is a good sign that Voyager 1 is getting close to the heliosheath. The team is also looking at the intensity of energetic particles from inside the heliosphere. These have been steadily decreasing but have yet to drop off abruptly, as would be expected when the craft leaves the heliosphere. Lastly, there is the measurement of the direction of the magnetic field lines surrounding the spacecraft. Currently, while the craft remains in the heliosphere, the field lines run east-west. However, when it passes into interstellar space, it is thought that the field lines will switch to running more north-south. There is still much analysis of the data to be done, but we can still expect that one day Voyager will be our first man-made ambassador to interstellar space. NuSTAR has been a pretty big name in the news for a while and we’ve blogged about it before. Well on Wednesday June 13th NuSTAR was launched from the Orbital Sciences Pegasus XL plane to which it had been attached. Many of us here at Goddard gathered to watch the live feed of the launch and waited quietly to see if the launch would be successful. Good news – it was! NuSTAR began its many step process to get to orbit at 12:00:42 pm EDT, exited the atmosphere, and extended its power producing solar panels. 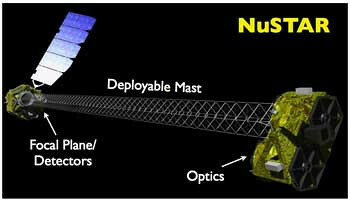 After waiting a week for news, the mission just reported that NuSTAR has successfully deployed its 10 meter mast. Now all that’s needed is a fair bit of calibration and then we’ll see what this awesome telescope can do – and keep an eye out for a post on NuSTAR’s first light image! 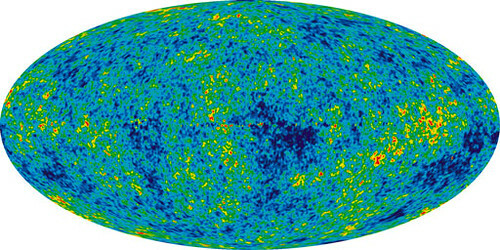 NASA’s Wilkinson Microwave Anisotropy Probe – WMAP for short – transformed cosmology as we knew it by establishing the age, geometry, and contents of the universe to astonishing precision. On June 20, the Gruber Foundation recognized this accomplishment by awarding its 2012 Cosmology Prize to WMAP principal investigator Charles L. Bennett at Johns Hopkins University in Baltimore and the science team he led. The WMAP spacecraft was launched in June 2001 to make fundamental steps in the area of cosmology. Cosmology is the study of the beginning, evolution, grand structure and the ultimate fate of our universe. WMAP has done this by observing the cosmic microwave background, the oldest light yet seen, emitted when the universe was only 378,000 years old. By studying this light, the information from WMAP has been able to tell us that the universe is 13.75 billion years old and has a flat geometry which support current theories for the origin of the universe. WMAP has parked itself in an orbit around the Sun and continues to study our universe and hopefully still has more to tell us. Hubble and Swift detected the first ever changes in an exoplanet’s atmosphere! The exoplanet, named HD 189733b, is a gas giant much like Jupiter but a bit larger and more massive. One of the interesting things about it, though, is that it orbits around its parent star ever 2.2 days at a distance 30 times closer than Earth orbits the Sun. As it turns out, this poor planet is having its atmosphere blown away because it is so close to its star. From our perspective, HD 189733b passes in front of its star each time it orbits, allowing astronomers to study the planet’s atmosphere as it is back-lit by the star. In an April 2010 observation of the planetary system, Hubble detected no trace of the planet’s atmosphere. Then a follow-up observation in September of 2011 showed a large plume of gas flowing away from the planet. Shortly before Hubble saw this plume of gas, the Swift X-ray telescope observed the parent star get over three times brighter in the X-rays. “The planet’s close proximity to the star means it was struck by a blast of X-rays tens of thousands of times stronger than the Earth suffers even during an X-class solar flare, the strongest category,” said co-author Peter Wheatley, a physicist at the University of Warwick in England. This blast of X-rays bombarded the planet and blew off a chunk of its atmosphere. It will be interesting to continue to observe this system and see how the planet fares in future flares. Hubble gives us another beautiful image. 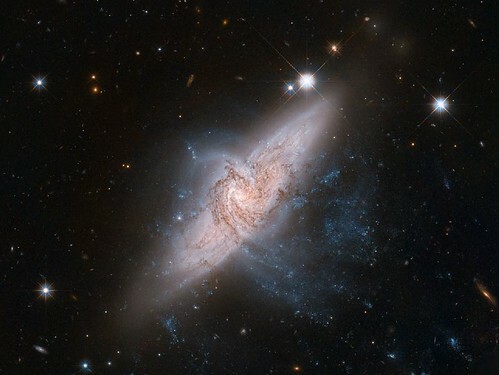 Here we have a rare view of two overlapping galaxies, called NGC 3314. But here’s the trick, these two galaxies are actually separated by tens of millions of light years (around ten times the distance between our own Milky Way Galaxy and our closest galactic neighbor, the Andromeda Galaxy). This chance alignment, from our perspective on Earth, allows a unique opportunity to see the spiral arms of the foremost galaxy silhouetted against the light from the farther galaxy – the dark trails are the dust lanes in the spiral arms of the closer galaxy. According to scientists from the Subaru and Keck telescope, a new galaxy may steal the title of the most distant galaxy known. The galaxy, SXDF-NB1006-2, is a whopping 12.91 billion light years from Earth! Because the light has to travel so far and only travels at one speed, we are seeing the galaxy as it was 12.91 billion years ago – this is less than a billion years after the universe was created in the Big Bang (a very young universe in astronomical terms). 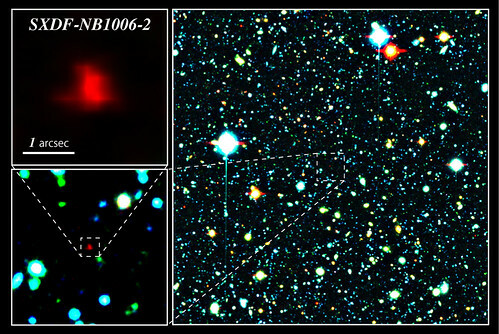 This says that SXDF-NB1006-2, the red blur in the upper left image (the others are larger fields of view), was most likely among the first galaxies to form. The Big Bang is thought to have sparked the universe into existence about 13.7 billion years ago. At first, it was too hot and dense for even atoms, to bind together (let alone stars and galaxies). As the baby universe expanded, it cooled, and eventually protons were formed, which then linked with electrons to form neutral hydrogen atoms 380,000 years after the Big Bang (give or take a few hundred years). This hydrogen gas expanded and cooled over time to create the first galaxies some 200-500 million years after the Big Bang. Galaxy SXDF-NB1006-2 is thought to have existed around 800 million years after the Big Bang, so it offers a glimpse closer than ever to that critical time. It is hoped that by studying SXDF-NB1006-2 and other early galaxies and objects like it astronomers will be able to piece together what our universe was like in its infancy. 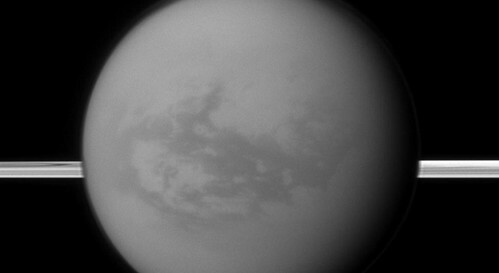 NASA’s Cassini spacecraft has spotted long-standing puddles on Saturn’s moon, Titan (above), made not of water, but of methane. Methane is made of one carbon atom and 4 hydrogen atoms, is abundant here on Earth and seems to be important on Titan. Much like Earth’s water cycle, Titan appears to have a “methane cycle,” where it is methane circulating rather than water. Global circulation models of Titan have suggested that liquid methane in the moon’s equatorial region evaporates and is carried by wind to the north and south poles, where cooler temperatures cause methane to condense. When it falls to the surface, it forms lakes at poles. There are also new results from Cassini that there are lakes or puddles closer to Titan’s equator that have been there for some time. Methane rain has only been detected once, so it doesn’t appear to be how these puddles are being replenished, suggesting a source from beneath the surface. Methane is a large building block in Titan’s organic chemistry, and is involved in many reactions that could produce interesting molecules like amino acids, which are, in turn, a building blocks of life. Cassini has many opportunities to fly by Titan in the future and will hopefully continue to provide more and more information to study.